Abu Dhabi is a place of borrowed architectural forms and appropriations; a city full of towering structures that say everything about the power of money and — for the most part — very little about the culture, traditions and heritage of its people. Against that backdrop, what can an architect like Jean Nouvel — one who believes in the importance of ‘singular’ architecture and abhors buildings created without sensitivity to their own specific geographic and cultural situation - do? Charged with the heavy responsibility of creating the first destination venue for a new arts quarter on a new island claimed from the sea, Saadiyat Island, his response is to evoke the traditional roots of Arab architecture and urbanism, and the elements of the site itself. And he’s right. 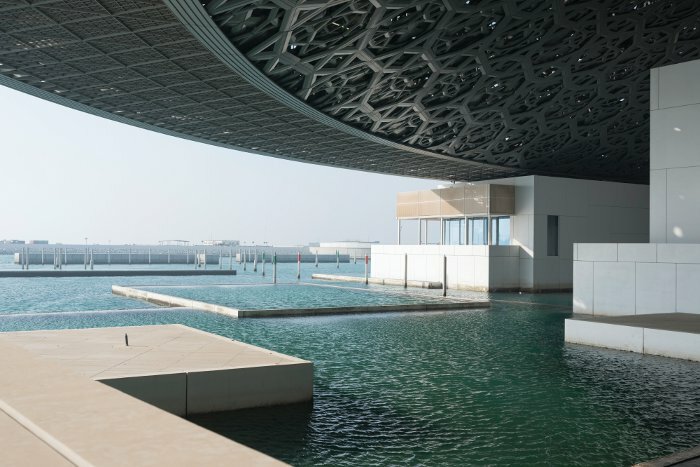 The Louvre Abu Dhabi is set low, close to the water. A monumental but simple sequence of white, mostly single-storey cuboid blocks, the galleries and facilities are arranged like a traditional Arab medina around a series of public squares and promenades, most of which are orientated towards pools of lapping sea water. And over this ‘museum city’ hovers an extraordinary structure: a dome to signify the sky, the constellations represented by almost 8,000 geometric stars layered thickly to form a metal parasol whose perforations throw a poetic patterning of light across floor, walls and water — a ‘rain of light’, as Nouvel puts it, intended to evoke the dappling of sunlight through the leaves of palm trees. Protected from the scorching Middle Eastern sun by this metal dome, one is indeed — even at midday in the still roasting month of September — aware of a gentle sea breeze, which is channelled through the museum’s ‘streets’, both narrow and wide. There are 55 buildings in the museum city, including 23 galleries both permanent and temporary, and a children’s museum. Supplementary, standalone structures include a two-storey auditorium, which sits at one end of the site’s watery perimeter, and a two-storey restaurant and cafe — still under wraps during our visit — placed at the outer, seaward edge. Nouvel’s masterstroke is to make the entrance extremely low key; the roof structure is only just visible from the vast car park, peeping out over the simple, white cube structures of the entrance buildings. He does so for a reason. After processing through the cool and neutral white-walled public spaces — entrance lobby, ticketing area, cloakroom and shop — the big reveal, as you emerge into the first plaza, is all the more dramatic. 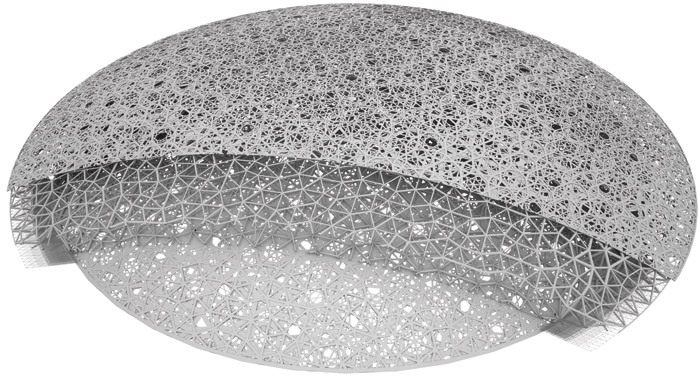 The dome literally dazzles: the enormity and weight of this substantial steel structure is balanced by the delicacy of the geometric mesh. For all the references to ancient Arab building forms, this is a supremely modern endeavour. The building facades are made of 3,900 panels of ultra-high-performance concrete. The dome, developed in conjunction with Buro Happold, consists of eight metal layers: the outer four are clad in stainless steel and the internal layers clad in aluminium, separated by a steel frame. Its complex geometric patterning has been calculated through both cutting-edge software and scale modelling in a sky lab, and refined to provide an optimal level of light and shade. It also weighs 7,500 tonnes in total (almost as much as the Eiffel Tower). With a diameter of 180m, the dome is supported by four permanent piers, each 110m apart and hidden in the buildings, creating the impression that the dome is floating. As well as providing a spectacular shading device, the dome also reduces energy consumption in the buildings it encloses, both through solar shading and strategic light percolation, and allows visitors to circulate outdoors within its self-regulated micro-climate. The placement, form and programming of the galleries has been carefully developed by the Louvre’s team, along with Nouvel’s, whose remit was expanded at a later stage to cover interior design, ‘scenography’ as well as ‘museography’. Now all the interior spaces bear his hallmarks, from the continuity of fine white concrete on interior and exterior walls and the same Italian granite flooring in public spaces both inside and out, to the slick, black-lacquered furniture he has designed to take gallery pamphlets and the long, low, black leather sofas that offer respite in the lobby and waiting areas. The Louvre came on board as a partner after Nouvel’s project had been awarded (adding a cost of $525m/£402m for a 30-year lease of the Louvre name and expertise, compared to the $108m/£82.5m cost of the structure itself ). While Nouvel quips that his ‘Frenchness’ was pleased at this connection, it required a complete reworking of the original plan. This, however, is part of the beauty of his museum as city typology. As with its inspiration, the traditional medina, the buildings can be shifted, expanded, shrunk and reconfigured indefinitely, according to requirements, but still work as a coherent collection of connected spaces united under that sheltering and dramatic dome. As for the contents, there was little to see in September, apart from photocopies of renaissance masterpieces and ancient vessels, pinned in place. This is not a modern art gallery — that privilege is retained for the Abu Dhabi Guggenheim, a neighbouring proposal that is far from built. 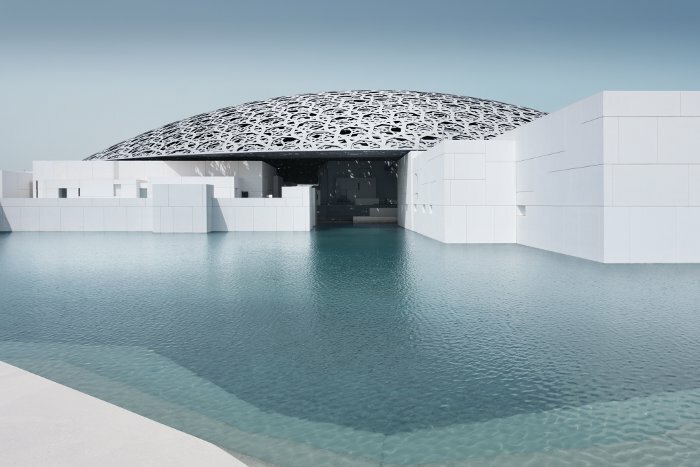 Instead, the Louvre Abu Dhabi will span the entirety of human existence, from prehistoric objects to commissioned contemporary artworks. Rather than separate items out according to classical museum divisions (by region, civilisation, art form or material), this museum will place contemporaneous and thematically linked objects side by side, in 12 ‘chapters’ exploring the artworks’ role in expressing or mediating universal experiences, including maternity, birth and death. With 650 artefacts, there will be some from Africa and the UAE region, though most will come from the collections of 13 of France’s leading museums. The interior setting for these treasures has been conceived by Nouvel as a sequence of rooms in a contemporary palace. Each gallery’s dimensions are calculated to suit the scale of the works destined for it. Each floor features an inlaid section of marble slabs, outlined in bronze and combined into a huge ‘rug’, featuring a specific stone, chosen to resonate with the room’s contents. Bespoke bronze display cases have been fabricated by Meyvaert in Ghent to a design of Nouvel’s, so that they offer a monumental scale appropriate to the rooms’ dimensions and also to the selected objects. Despite the presence of such important artworks as Piet Mondrian’s 1922 Composition with Blue, Red, Yellow and Black, filtered natural light will be present in all galleries, either coming from glazing in interstitial spaces, whose deep windows offer veiled views on to the sea, or through zenithal lighting involving glass mirrors that capture sunlight and direct it into the gallery space. There are 17 glass ceilings within the galleries, which incorporate both natural and artificial sources to provide the optimal illumination for highlighting and protecting the art works on display. Contemporary artists Jenny Holzer and Giuseppe Penone have been commissioned to create site-specific works, with three huge text-pieces carved on to stone in Arabic, Roman, and cuneiform script, and a monumental bronze tree decorated with mirrors, respectively. The luxurious and contemplative interiors and the pleasures of moving in and out of the buildings beneath the domed sky are certainly bewitching. As a piece of contextual architecture it eclipses many of the world’s more clunky, iconic structures, and is sure to be a hit on Instagram. But whether it will draw a new kind of cultural tourist — or attract the wealthy Emirati out to visit these treasures, along with the region’s mix of international expats — is another matter. And what of the visitor experience? Without contents or crowds, it was hard to conjure an accurate picture of what the real museum will be like when it opens officially in November. But there is certainly a huge focus on consideration for the customer experience — which is just as well, given how little else there is to entice them out into this newborn cultural quarter. Although the linking bridges between Abu Dhabi and Saadiyat are now complete, the current landscape seems to be all rubble, cranes, trucks and freshly planted palm trees. When the island was first proposed, it was intended to feature five ‘great’ museums by five world-class architects, though whether all five will get built remains unclear. Tadao Ando has designed a Maritime Museum to celebrate the city’s trading and sea-faring heritage (still unbuilt). Zaha Hadid was assigned to create a vast performing arts centre (also unbuilt). Gehry’s Abu Dhabi Guggenheim (a version of his Bilbao museum, on steroids) also seems to have stalled, though the Guggenheim has embarked on its collection. The next building scheduled for completion after the Louvre is Foster + Partner’s Zayed National Museum, supposedly curated in partnership with the British Museum, but local sources at the Louvre launch event hinted that the British Museum had recently closed up its Abu Dhabi office and left town. But the publicity claims that they will all complete within the next decade, at a total construction cost of more than £20bn, bringing to the region five monumental cultural destinations. Certainly, part of the impetus for this development comes from the knowledge that one day the oil will run out, by which time a far more solid tourism-, finance- and tech-driven economy is planned to sustain the city’s skyscrapers. 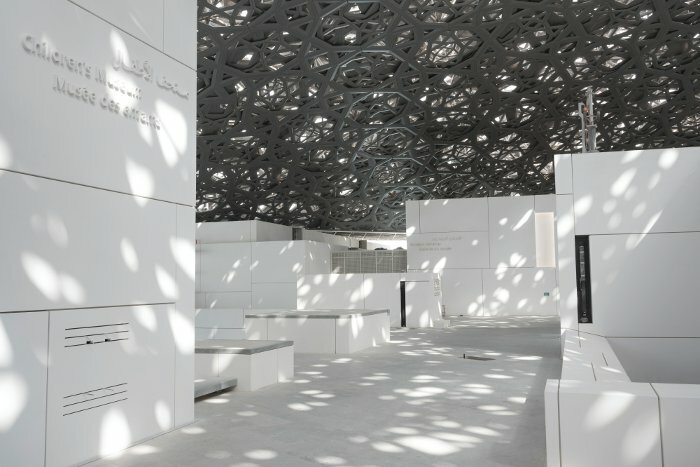 Senior executives for the Louvre Abu Dhabi emphasise the importance in the region of having the first ‘museum that focuses on shared human stories across civilisations and cultures’. But achieving the necessary visitor numbers — especially regular visitors, who are likely to be drawn from the region itself — will require far more than a few educational outreach programmes and a classy restaurant. 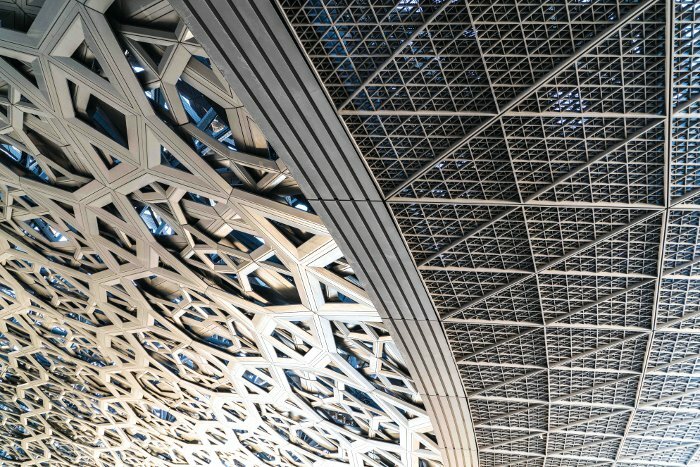 Jean Nouvel’s interest in the culture and architecture of the Middle East can be traced back nearly four decades to the Institut du Monde Arabe. Begun in 1981, it was 1987 by the time his groundbreaking structure opened in Paris, with its glass curtain-walls featuring metallic screens, made up of folding and unfolding geometric motifs. 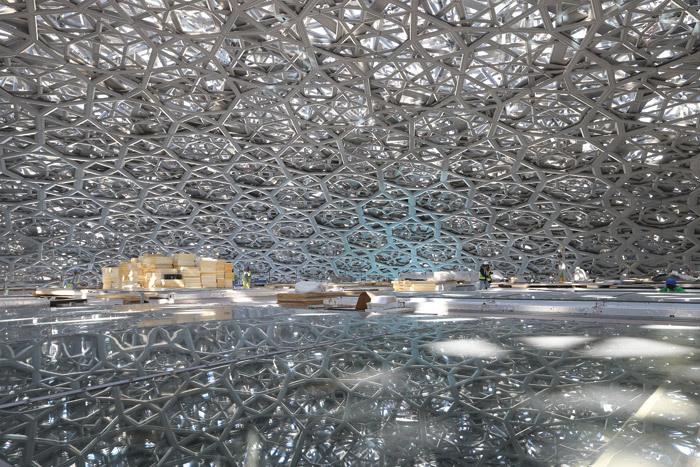 Veronica Simpson talked exclusively with Nouvel at the Louvre Abu Dhabi about the region and its inspirations for him. Veronica Simpson: Where did your sympathy for Arab forms and culture originate? 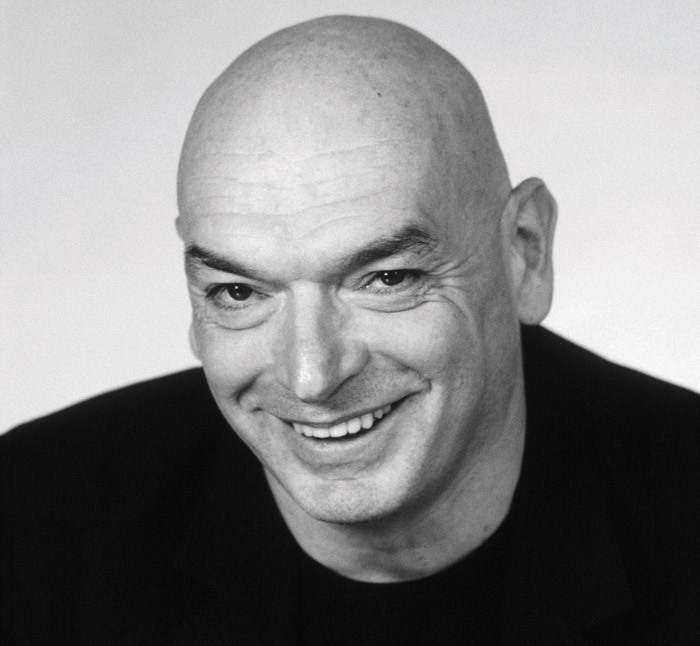 Jean Nouvel: I went to Morocco; I travelled also in Cairo. What I like is the differences to the character, the singularity between Arab culture and its relationship with climate, the architecture and its relationship with the culture of Islam. VS: Yet we are in a region that has appropriated many architectural forms that are alien to its climate and culture. JN: All the world is full of cities like this now. It’s a big, big, big question. It’s the main question of architecture today. And urban planning becomes a kind of authorisation to do anything… with objects or a group of objects totally dissociated with what is around. We cannot live like this. And we cannot expand the city indefinitely like this. 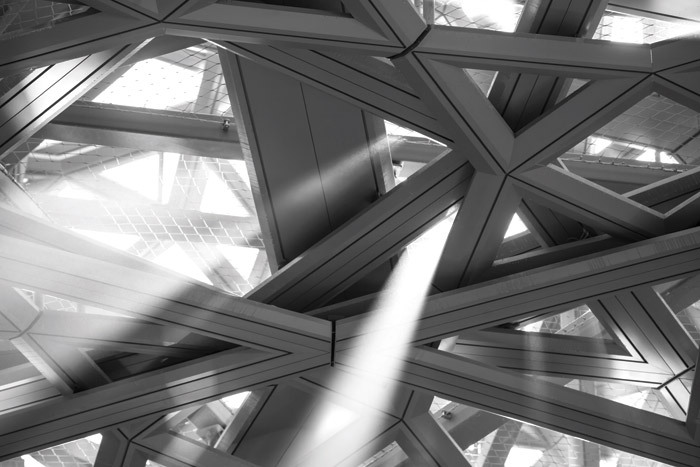 VS: What can your Louvre Abu Dhabi building do to address that imbalance? JN: I think because I don’t do the same building in Abu Dhabi and in Paris. If you look at every building I do, I cannot imagine them in any other place. 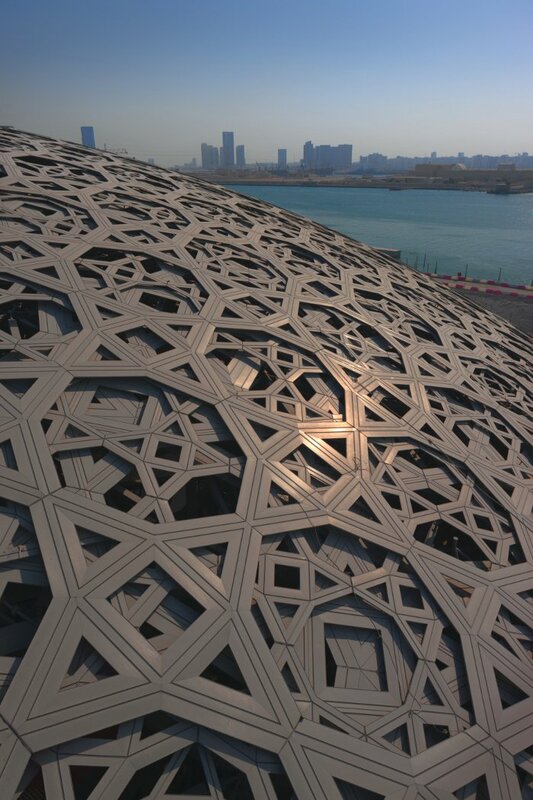 Can you imagine that building [the Louvre Abu Dhabi] in London? In America? No. So when you work with the material of the place, it’s not only the site or the physical point of view, it’s the culture of the place, its history and geography. You translate it to the epoch of today. You link it to living cultures and traces of these cultures. And you look at the people and you want to give them something. Architecture is a gift. You are not here to be disagreeable to the people living here or to the client of that project. We want the opposite of that. When you take all these parameters you cannot move this building. It’s not possible, I think. VS: What visitor population did you have in mind when you were designing it? JN: It’s always the same story: when you are in an economical golden age, every city in the world, for centuries and centuries, has built their main buildings to be a testimony to this epoch… to give something to the future generations. We are exactly in this age [in Abu Dhabi]. It’s not orientated on one kind of visitor. Of course it’s for them first. Also, they want to develop tourism, and have more cultural tourism. If they do a cultural district like this, it is to become a destination. VS: You talked on the tour about the pleasure of the experience for the visitor. You have clearly thought about this a great deal. JN: The research [for the project] is linked to pleasure. It is always a pleasure to be in the shadow, in relation to the sea, to the harbour. The building belongs to the sea. VS: The light and shading of the dome is pivotal, however. JN: The rain of light is a display and it’s also a memory. When you are under a tree you have lots of little spots of light. For me the Greek and Arab architecture is always to do with light and geometry. The mosque is always for me the relationship that is the most sensitive to light and geometry. And this is why they developed the system of mouche arabie, which the dome references. We also wanted to play with the concept of shadows of the streets. So through keeping the character of the medina and transposing it into the museum is a way of exploring Arab identity. 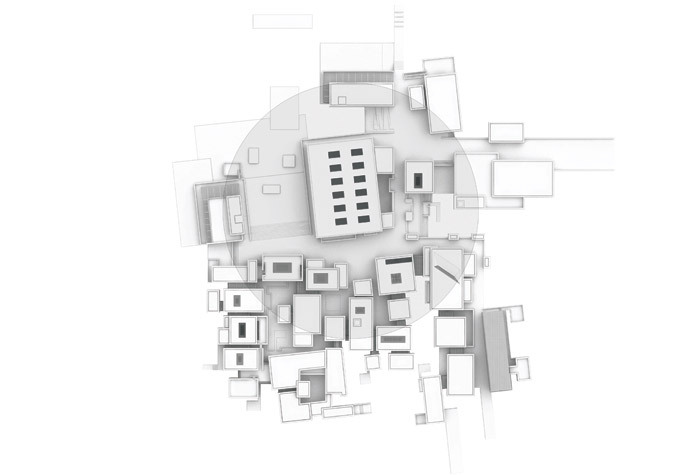 We want to provide a contemporary take on Arab culture and architecture.